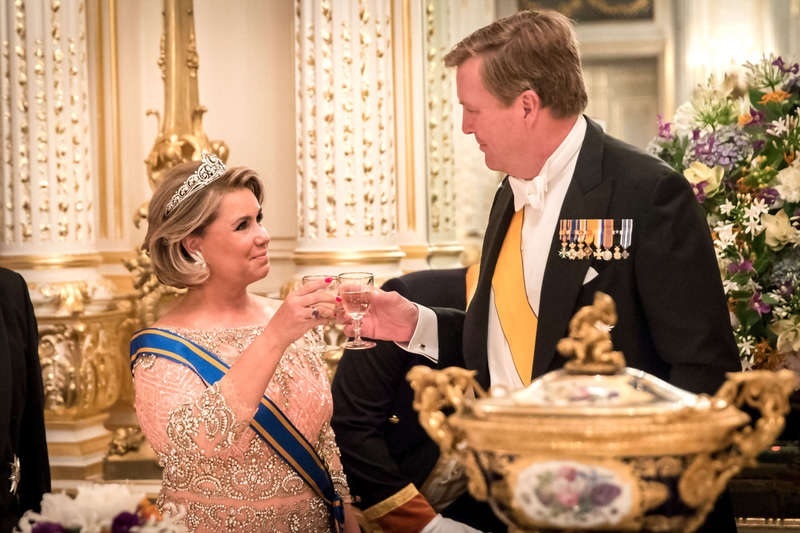 It's the moment many have been waiting for since King Willem-Alexander took the throne: Queen Máxima wore the Stuart Tiara for the state banquet in Luxembourg tonight! It's a smaller version of that elusive Dutch big gun, to be clear; the setting has been lowered, the namesake pear-shaped Stuart Diamond has been removed from the top center with a smaller substitute in its place and other large diamonds from the top have been removed. Which was predictable, really; it is a massive tiara that comes with smaller settings, so easing into it is logical. Queen Máxima is wearing two of the removed large diamonds as earrings. Read the tiara's full story here. There's the full version, as worn by Queen Juliana. The tiara was created for Queen Wilhelmina in 1897 and was regularly worn by Juliana, her daughter. Once Juliana's daughter, Beatrix, took over the throne, the tiara went unworn. Unworn for more than 40 years. Until now! There is also a set of mega diamond jewels, the Stuart or House Diamond jewels, that Juliana wore with the Stuart Tiara. Máxima debuted the necklace from that set last year. Here, she wears the large bow brooch from the set, which she's used before. Her dress is a Jan Taminiau repeat. Also, other people were there! Let's do a quick sash check (left to right): Hereditary Grand Duke Guillaume in the Order of Orange-Nassau from the Netherlands, Grand Duchess Maria Teresa in the Order of the Netherlands Lion, King Willem-Alexander in Luxembourg's Order of the Gold Lion of the House of Nassau, Queen Máxima in the same, Grand Duke Henri in the Order of the Netherlands Lion, and Hereditary Grand Duchess Stéphanie in the Order of Orange-Nassau. Blauw Bloed screencap. Click here for more sparkly video. The Luxembourg ladies doubled up on their Elie Saab, Maria Teresa in a repeat and Stéphanie borrowing another dress from her mother-in-law's closet. 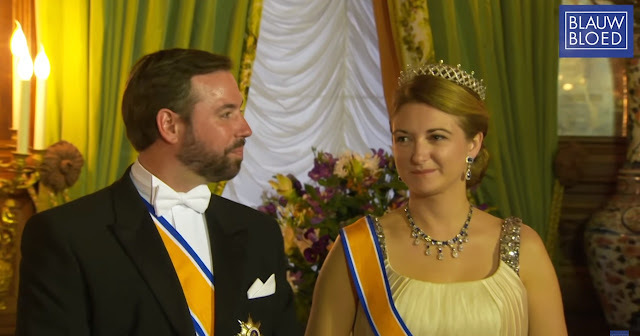 The Hereditary Grand Duchess is giving us a double tiara appearance, technically, and a debut; she's wearing the Chaumet Diamond and Pearl Choker Tiara for the first time (without the pearls), and her sapphire and diamond necklace can also be used as a tiara. I must say, I'm a little disappointed in Maria Teresa when it comes to the tiara department. If there was ever a time for the Luxembourg Empire Tiara, right? 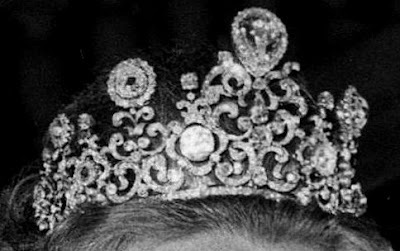 Instead, the Grand Duchess stuck to her current favorite, the Belgian Scroll Tiara. Good thing her dress is divine, easily my favorite of the evening. The Dutch arrived for their state visit to Luxembourg earlier today. The visit continues through Friday.